With the purpose to reactivate the PAHO/WHO Collaborating Center (CC) Network in Brazil and to affirm their contribution to the Organization’s technical cooperation, which supports the country in its implementation of the 2030 Agenda and in reaching the Sustainable Development Objectives (SDO), all the CCs in the country were invited to a meeting held on July 31 and August 1, 2018. The event was attended by 19 of the country’s 20 CCs, representatives of the Pan American Health Organization (Central Office, Representation in Brazil and BIREME – where the event was hosted), the President of Brazil, the Ministry of Health of Brazil and the Fundação Oswaldo Cruz (Fiocruz – Oswaldo Cruz Foundation). “Our expectation is that this work meeting will allow for the recognition and exchange of experiences between Collaborating Centers and other participants and provide a moment for collective reflection on the set of challenges and opportunities, while focusing on the implementation of the 2030 Agenda”, stated Dr. Joaquín Molina, PAHO/WHO Representative in Brazil. After a day and a half of presentations and debates, including the main results of the CC work plans, reflections on their relation with the SDO and also on the possibilities of working together as a Network, the conclusion was that research, development and innovation, as well as capacity development and south-south cooperation are common elements in CC activities and must be strengthened while advancing towards the 2030 Agenda. 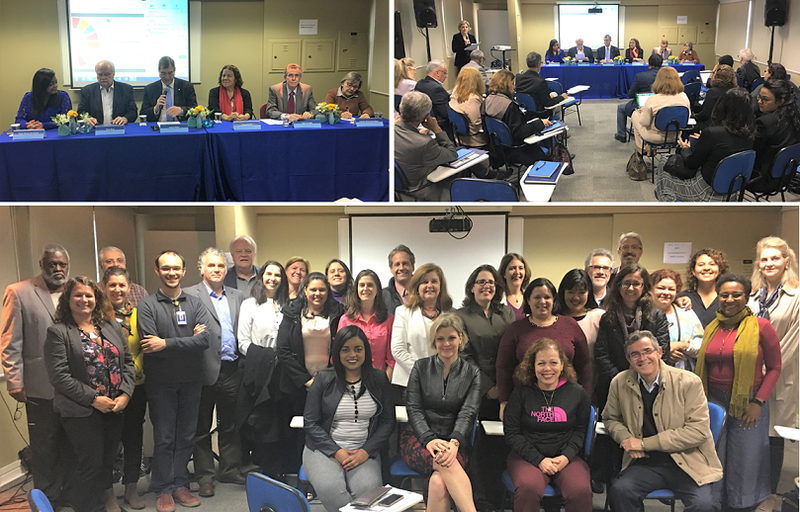 Furthermore, and keeping in mind the challenges that this represents, the Brazilian PAHO/WHO Collaborating Center Network has been reactivated with the objective of strengthening capacities for the implementation of the 2030 Agenda. The presence of the CCs during the meeting at BIREME was an opportunity for exchange between all collaborators and demonstrated that, within the framework of the Center’s mission of democratizing information, knowledge and evidence, the Brazilian CC Network can count on BIREME as another space to give visibility to their scientific production, remarked Dr. Diego González, the Center’s Director. The Collaborating Centers of the World Health Organization are a cooperation mechanism in which referenced institutions are designated to support PAHO/WHO technical programs in implementing their programmatic and strategic objectives. The Collaborating Centers exist since the foundation of the WHO. Today there are over 800 CCs in more than 80 Member States, of which approximately 193 are in the Region of the Americas. Aside from contributing with Objective 3 of the SDO, which relates to health, the Network of PAHO/WHO Collaborating Centers contributes to reaching SDO 17: “17.9 Enhance international support for implementing effective and targeted capacity-building in developing countries to support national plans to implement all the sustainable development goals, including through North-South, South-South and triangular cooperation”.